The Aquaculture Center serves a community of diverse students with a broad range of social, economic, cultural and ethnic backgrounds who bring to the school a variety of skills, talents and learning styles. 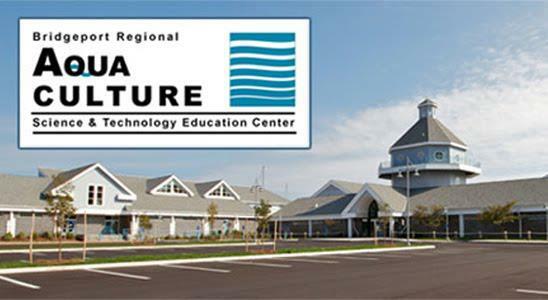 We offer students from school systems in the greater Bridgeport region the opportunity to enhance the traditional academic high school curriculum with a specialized emphasis on science and technology instruction as related to the development of aquaculture in the State of Connecticut. If you do not know the name of your child’s teacher, please refer to the attached list of teachers and courses. If you are unable to attend you may contact your child’s teacher via the email on the attached file. Reminders of your signup are sent to the email you enter on the sign up. Also, if you need to cancel you need to do it through the sign up. The Sophomores and Juniors at the Aquaculture School attended a presentation on the UCONN Early College Experience, BACA and U B's Dual Enrollemnt programs that are offered at the school. Find more information here - UCONN ECE_UB Dual Enrollment_BACA. APTSSO announces that our "Spring Spirit Wear" is online for purchase! The spirit wear sale link below is currently live BUT it will close promptly on MONDAY AFTERNOON, APRIL 22, 2018. Please do not wait until the last minute to order as we CANNOT extend the deadline! For parents of graduating seniors, this spirit wear sale is a great way to purchase a graduation gift for your Aquaculture senior! For all parents, this is a great way to purchase spirit wear for your student for the 2019-2020 school year! All items will be delivered to the Aquaculture School pre-packaged with your student's name on it the week of May 20th. Please note that the order form has been updated and asks for your Aquaculture student's name and address. Please just put in your student's name and your address! We cannot offer a return policy as your order is placed directly through our supplier, so please note the sizes on each item. Some of our spirit wear items have men's sizes and some items have women's sizes, but most are unisex sizes, so please note the sizes on each item, and take the time to read the descriptions for spirit wear items. ***For parents whose order is a GIFT, please let us know as soon as possible by sending APTSSO an email at: bgptaqua@gmail.com and we will not give it to your son/daughter when it arrives. We will alert you when the delivery is made and you can pick it up at another time. APTSSO is responsible for each spirit wear sale, so if you have any questions OR need more info, please contact APTSSO ONLY via email at: bgptaqua@gmail.com DO NOT CONTACT THE SCHOOL! AQUA SENIORS: GET YOU UNIQUE AQUA PROGRAM TRANSCRIPT!! Show your top schools all of the amazing things you have learned at Aqua.Complete the Program Transcript (following directions) as a Word document and email it to Ms. Catherman ASAP! Angie's Seafood market will open every Thursday , starting September 20th from 3-6pm. Please stop by! Please click on the link below to access the Parent convention registration forms.